The U.S. Air Force's fleet of radar-evading F-22 Raptor fighters has been grounded until "further notice." It's the latest blow to the reputation of the world's most expensive, and allegedly most fearsome, dogfighter. "The stand-down is a prudent measure following recent reports of oxygen system malfunction," Gen. Will Fraser said. Without oxygen, Raptor pilots can't fly at the high altitudes where the sleek, supersonic Lockheed jet performs best. The Air Force began to put the boot on the Raptors after pilots reported "hypoxia and decompression sickness" - a good sign they weren't getting enough air from their planes' systems. Before the full stand-down, the flying branch tried limiting the F-22 to flying below 25,000 feet, but the problems apparently continued. Sidelining Raptors at their bases in Virginia, New Mexico, Alaska and Hawaii - plus rotational locations in Japan and Guam - effectively cuts in half the Air Force's dogfighting fleet, which also includes around 250 older, Boeing-made F-15Cs. Raptors can still fly on urgent "national security directed missions," but routine patrols and training are forbidden. The grounding is the latest in a long series of embarrassments for a jet the Air Force insists "cannot be matched by any known or projected fighter aircraft" - a claim increasingly challenged by Russian and Chinese stealth prototypes. Of course, it's easy to defeat a plane that can't fly. When U.S. forces went to war over Libya, the F-22 sat idly by. Explanations varied for this no-show. Some observers speculated the Raptor was useless over Libya because it hasn't received necessary upgrades for swapping data with other, non-stealth jets. The Air Force claimed the Raptors, which are concentrated in the Pacific, were simply too far from North Africa when fighting broke out. There have been previous mechanical and software problems, too - the sort of things which, to be fair, are not unique to the F-22. Last year, rust problems briefly grounded most of the F-22 force. A whole squadron of Raptors had to turn back from a planned flight from Virginia to Japan in 2007 when their navigational systems went haywire as the planes crossed the International Date Line. 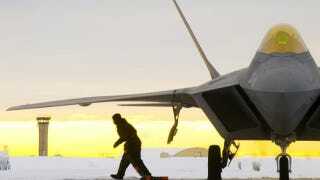 In 2006, an F-22 pilot was stuck in his plane on the ground for five hours because the canopy wouldn't open. Two Raptors have crashed since the jet entered service in 2005. The smaller F-35 Joint Strike Fighter, also made by Lockheed, is meant to complement the F-22 starting around 2016. The F-35 was meant from the outset to be more reliable than previous airplanes. But early experience on the JSF indicates it could be as finicky as its bigger cousin, the F-22. The future Air Force could have its hands full just keeping its high-tech planes in the air.